Nearest station is Barnes over ground rail station. The shortest walk is from Roehampton via Danebury Avenue. Parkcycle is most easily accessed by car however it is possible to reach the location using public transport and a 15 minute walk - see the alternatives below! 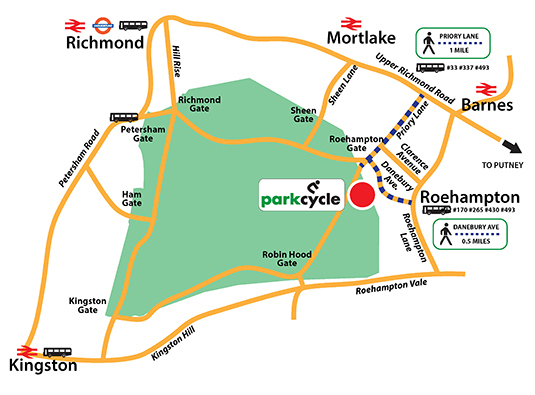 The cycle centre is in the Roehampton Gate Car Park next to the Cafe and there is plenty of space. There are six car parks in all within Richmond Park and these are clearly marked on the official park maps. Parking is currently free. Occasionally in bus or good weather periods the car parks can become full; in this situation please do not park on the roads or grassland (you will be ticketed). You can get further information on car parking in Richmond Park here. All car parks have designated disabled spaces. There is a disabled-badge-holders only car park for the Isabella Plantation, access via Ham Cross.